Words have always had a profound effect on me. Not just the ones that cut and tear, also the ones that build and inspire. For as long as I can remember, people have been asking me the question "why are you crying?". It used to embarrass me, as if I was doing something wrong. I'd apologize and say that I was an emotional person, until I realized that was nothing to apologize for. I am me. A couple of years ago, in a room full of at least 100 people at a blogging conference, I found myself brought to tears (of the inspiring sort) listening to Monica Bhide's presentation. It wound up being my favorite portion of the entire conference, and I was so happy to have the chance to meet Monica and chat with her briefly later that day. I've been a fan of hers ever since, following her on twitter and reading her website, so I was thrilled to hear that she released her first novel...a food lovers novel, at that...this month. I will have it in my hands shortly and am looking forward to reading it and sharing a dish inspired by it. Until then, in anticipation of Karma and the Art of Butter Chicken, please enjoy this story about and recipe for butter chicken from Monica Bhide. In 1980 when I was 10, we lived in the Middle East, and Thursday was the start of the weekend. 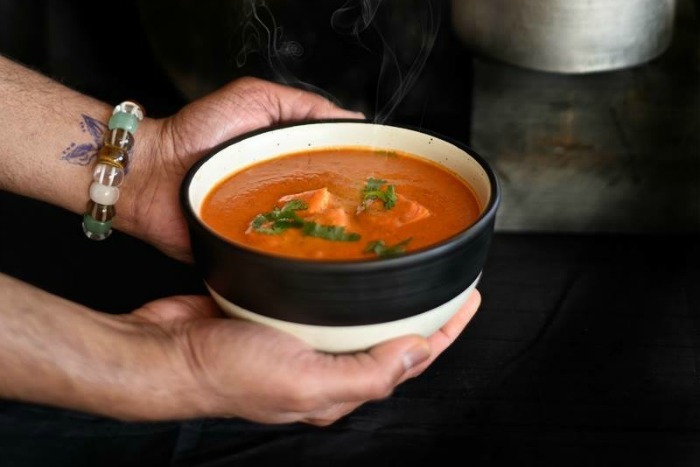 I'd huddle with Dad in our small galley-style kitchen as he began making butter chicken: a glorious dish of chicken pieces marinated in yogurt, cumin, fenugreek, ginger and garlic, oven-roasted and cooked in a sinful, creamy butter and tomato sauce. "The first thing is the chicken," he would say. "If the chicken is not of good quality, you can forget the dish. The frozen chicken on the market is no good." Working closely with his butcher — my father still has a closer relationship with his meat vendors than most people have with their doctors — he would pick out the best chicken and have it chopped up his way. Dad began the marinade in a bowl filled with homemade yogurt in which he swirled his long, slender fingers to gently whip it. "Yogurt is the key. It tenderizes the chicken, it makes it soft," he said. "People forget that." My father is an engineer by trade. When we were kids and lived in Bahrain, he traveled constantly and was often gone for long periods of time. After a day at school, I'd wait for his return, rather irrationally, by the large windows of our cozy family room each night. When he finally came home — from Beirut, Dubai, Alabama, Delhi, London, Kuwait or Paris — he brought gifts of unusual foods, such as peanut butter, baked beans with bacon, Lindt chocolates and dates stuffed with pistachios. However, when he asked, "What would you like to eat this weekend?" the answer was always the same: butter chicken. After the yogurt came tablespoons of melted clarified butter and a large squeeze of lemon juice, then a slathering of pureed tomatoes. "This is the real butter chicken," he'd say. "I can tell you it tastes like the one from Moti Mahal restaurant in Delhi. Did I ever tell you that is where this dish originated? I will take you there when we are in Delhi next. We can eat and sit outside in the lawns and listen to beautiful ghazals [Urdu poetry]." The next morning, I would be up with him at 8, ready to go to the market to buy tomatoes for the curry. Years later, when he visited me in the States, he was appalled I went to the grocery store once a week. "You buy tomatoes now for use on Friday? They won't be fresh. What is the point?" Once after returning from London, Dad did not stop talking about chicken tikka masala — a British version of butter chicken. "It had onions. Who puts onions in butter chicken? I found out that it was originally created using a can of tomato soup? Soup in making butter chicken? Who does that?" The rant took several years to die down. His messy hands reached out to the spice cabinet for the treasures that made the dish sparkle. "Smell this methi, child, here, smell," he said. "When I was a kid, my mother would make it and it made the whole kitchen smell like paradise. Moti Mahal did not add this to their chicken dish. They should have." I leaned over and pretended to smell the dried herb, which smells like maple syrup, all the while reveling in the precious time with my father. He'd place the chicken pieces single file on a foil-lined sheet to roast in the oven as we began preparing the sauce. Then he would fish out his ancient grinder. He made me smell the pungent ginger, and he laughed as I scrunched my long nose at the garlic. Both went into the blender with fiery green chilies to make the paste. "Now is the secret nobody knows," he would say as he pointed to the pan. "This marinade has all the flavors from the spices and the chicken. This is what makes the masala real." He tilted the marinade into the wok. I watched him smile, frown and finally look at peace as the tomatoes cooked to his satisfaction and the oil moved out toward the sides of the wok. Then he added the chicken and cooked it until all the flavors melded. Years later, my son asked me to make butter chicken for him. Reluctantly, I did. He tasted it and declared, "It is really good, Mom, but his is better." Ah, the relief I felt. I still need my dad to show me how. 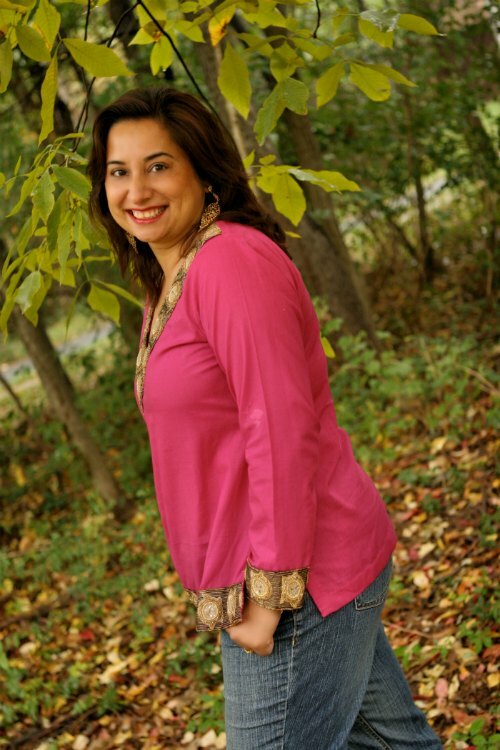 Monica Bhide’s work has appeared in Food & Wine, Bon Appétit, Saveur, The Washington Post, Health, The New York Times, Ladies Home Journal, AARP The Magazine, Parents, and many others. Her books have been published by Simon & Schuster and Random House (India). The Chicago Tribune named Bhide one of the seven food writers to watch in 2012. In April 2012, Mashable.com picked her as one of the top ten food writers on Twitter. 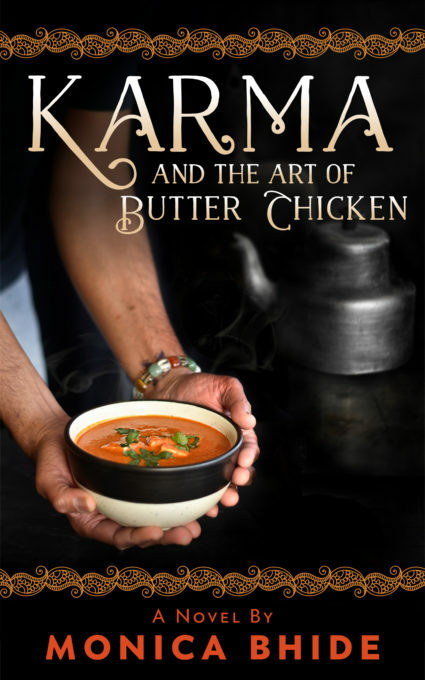 If you'd like to download the free e-cookbook offered with Karma and the Art of Butter Chicken, visit Monica Bhide's website! 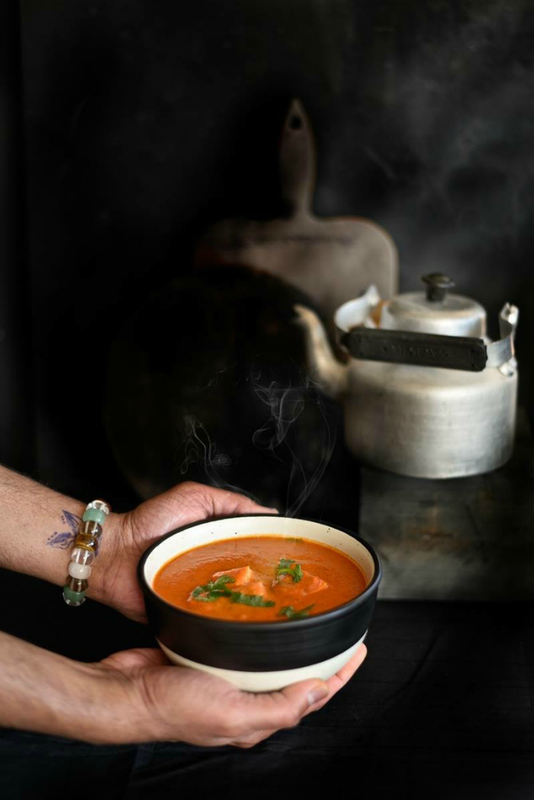 This is Monica Bhide's recipe for the rich curry that originated in Delhi, India. In a large bowl, mix together the yogurt, ginger, garlic, Indian tandoori masala, tomato puree, salt, lemon juice and butter. Add the chicken and mix well. Cover and refrigerate for at least an hour. Preheat the oven to 400 degrees. Place the chicken in a single layer in a roasting pan. Pour all remaining marinade over the chicken. Roast 20 to 30 minutes, or until the chicken is cooked and the juices run clear. Remove the chicken from the oven and place all the pieces on a platter. Reserve the cooked marinade in a bowl. To make the sauce, in a large skillet, heat the butter over medium heat. Add the ginger and garlic. Saute for about 30 seconds. Add the tomatoes and cook, stirring constantly. Use the back of a spatula to mash the tomatoes as you go. Continue until the tomatoes are completely mashed and soft, about 10 minutes. Add the salt, chili pepper, fenugreek leaves and chicken and mix well. Simmer covered for about 10 minutes. Add the cream and simmer for another minute. Serve hot. Recipe by Monica Bhide; printed with permission.